I wonder how many comments you have received on your blog? How many are from your teacher or classmates? How many from a commenter in the challenge? But most importantly, how many are from other people around the world? When I first began blogging back in 2008, I had a personal blog and after a week of writing posts, I had only 6 comments yet my clustrmap showed lots of visitors had been there. Why weren’t they commenting? 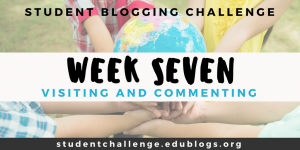 Follow Susan’s example – visit some blogs from the free choice or global issues posts and leave some comments – include your blog URL if you want them to visit your blog – or leave your post URL if you want them to visit a specific post to comment on. I’ve also included some great posts to visit below. Follow Inge’s example – write a post that gives guidelines or how to do something or expresses an opinion. Invite visitors to comment by finishing with a question. Follow David’s example – write a post for yourself showing your voice and putting your heart into it. Mrs Vazquez’s class created a thinglink explaining about commenting on their blog and also have a great image for their zoom story. Give your opinion on pizza by visiting Figgy’s post here. Ben certainly researched for his expository on dinosaurs. Rajyashoril asks what are some of the problems facing democracy and how can they be solved. I can tell McKenna wrote with passion on Jerry Lee Lewis. Lily notices lots of little things. Shanta looked at one topic for her photo gallery – grass. Check out the conversation happening between Allison and Shanta – also note how Allison has started her Blog Buddies list on the sidebar of her blog. Next week is game time, so make sure you have a blogroll on your sidebar or in a post or page. Have at least 10 links to other students or classes around the world that you have enjoyed visiting to leave comments on. Also make sure you have a visitor widget somewhere on your blog – clustrmap, flag counter, revolver map are three of the most popular. I have also added the 10 students from around the world and flag counter. I did the Visiting Activity for this week’s post. I really enjoyed this because of how I can connect with a lot of people through a blog. This was a really PIE-fect day for me. See you around! I wrote a Narrative recently, and I was hoping you would check it out! You are such an experienced blogger and it would be great if you could check it out. If you could give me feedback it would help me to be a better blogger as well! If you don’t it will be ok, but I still don’t have another commenter. I did a writing activity this week. I followed Inge’s advice and expressed my opinion in the form of a book review. I hope you will read my post.